Several weeks ago a few friends in my circle of advocates pointed out that there was a conference coming up in DC called Engage:Unlocking Patient Engagement Through Innovation hosted by MedCityNews. These friends were quite disturbed that there appeared to be no patients involved in a patient engagement conference. Sarah Kucharski (or @afternoonnapper on twitter) was one of those concerned advocates. She contacted Veronica Combs from MedCity News and expressed her frustration. Veronica looked into Sarah’s patient advocacy. She discovered Sarah is a leader in this arena and then Veronica asked Sarah to be part of a panel. Another health policy friend asked me if I would attend and I said, “Sure! As long as they are okay with me painting onsite.” He went to verify with the venue that painting would be okay. He was told no. So I would not be attending Engage. I love painting at events; I understand the content at a much deeper level when I paint. 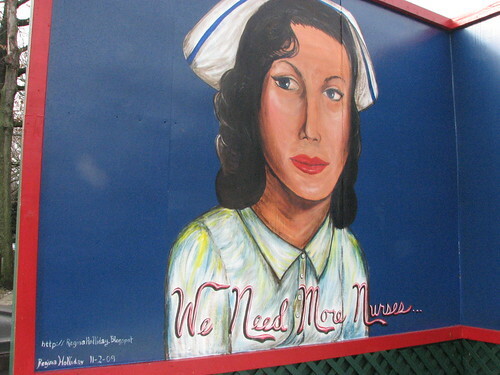 But more importantly, I feel that if a venue is unwilling to accept the “messiness of art;” they are also unable to accept the messiness of patients. On Tuesday I was walking in the hallway at Health DataPalooza when Veronica Combs approached me asking if I were going to attend Engage. I told her no because of their stance on my painting. I followed up by telling her I had considered protest painting in front of the conference hotel to make a point. Then Veronica did a brave thing. She did not laugh off my response or grow offended. She listened to me and started making calls. That evening I got an email from Chris Seper who was running the event. He explained at the time of my request there were putting out a lot of fires, hence the “no” answer and admitted the idea of me painting out front was sort of exciting. But would cherish my work more if I came in and attended the event. So I attended on June 5-6 and painted “My Baby.” I was also excited to see so many of The Walking Gallery members and amazing patient rights advocates like Gregg Masters, Pat Salber, Mary Anne Sterling, Alisa Hughley, Karen Herzog, Sherry Reynolds, Victor Montori and Matthew Holt at the event. The first thing I painted was the swirling funnel of energy I felt within this space. The air crackled with a multitude of attitudes about patient engagement. 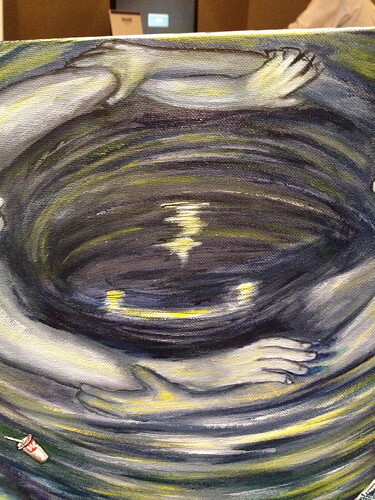 The swirl quickly became a man and a woman embracing within the maelstrom. Their arms formed a ring. When attendees questioned the symbolism I reminded them that in the world beyond the medical conference “Engagement” means a very different thing. It is a time to rejoice and send congratulations to the happy couple. 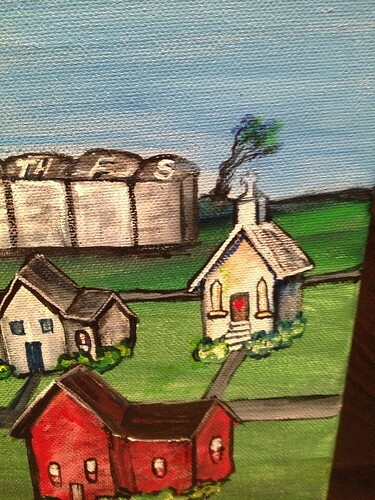 Then I began to paint the skyline of Enid, Oklahoma. This is the town where I was born and spent the summers of my youth. Recently, Oklahoma has been buffeted by a series of tornados. Listening to NPR, I heard several folks commenting that residents should just move to another state. Those statements reminded me of the often-paternalistic attitude toward patients who are non-compliant. Leave the land that a family has lived on for generations? I think not. 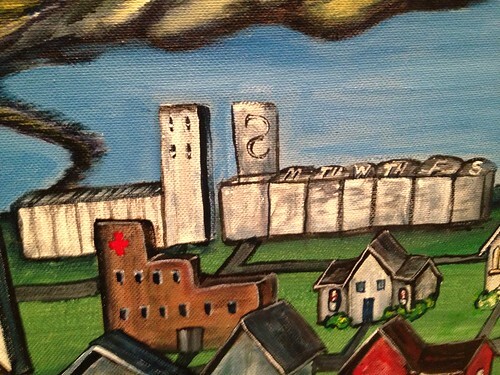 The skyline of Enid has some rather famous grain elevators. These silos seem like skyscrapers on the prairie. Located side by side, I modified one into a pillbox with the Sunday slot open. 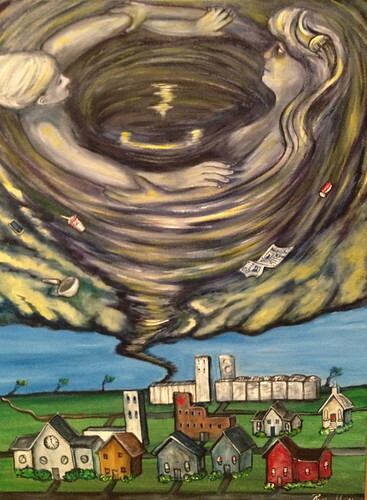 The tornado funnel of patient engagement approaches these silos preparing to disrupt. Right about then Will Yu was taking questions so I jumped up and grabbed the microphone to ask, “What are you doing to include artists and poets and musicians in culture change?” He spoke about all the work the federal government did to encourage video challenges when he was with the ONC(Office of the National Coordinator for Health Information Technology). But I think Will forgot he no longer works there. 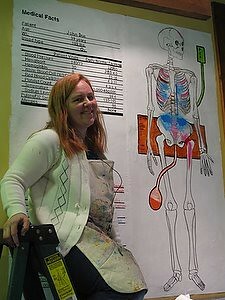 What is Wil Yu, the amazing brilliant one person working for the betterment of patients everywhere, doing right now to encourage culture shift through the arts? To create culture change we must all take part: this is not the Beetles; this is Beetlemania. We were also blessed to hear from Peter Levin, who had worked at the VA on Blue Button, (download and transmit patient data) and Lygeia Ricciardi, Director of the Office of Consumer e-Health, ONC. As they spoke I painted a faint Blue Button symbol into the funnel. During lunch I had a chance to speak with John Moore III whao is CEO and Founder of RxApps and we spoke about the importance of the community pharmacist. So I added a mortar and pestle to the painting. While this painting worked toward its resolution, a very special panel began: “What Do We Want as Patients, Consumers and Caregivers?” The moderator was Veronica Combs, Editor and Chief of MedCity News, the ever-irrepressible Suzanne Mintz, Co-Founder and CEO Emeritus, Caregiver Action Network, Adrienne Boissy, MD, Medical Director at Cleveland Clinic Center for Excellence, Sarah E. Kucharski, CEO/Chairman and Founder of FMD Chat and Roys Laux, General Manager Health Vertical, Angie’s List. As these women spoke, I returned to the funnel design of the painting. Dr. Boissy spoke of a client who she believed to be drug seeking. As she tried took a history the patient tried to describe her clinical journey. Dr. Boissy redirected the patient to focus on root problems. Then the patient explained her family did not believe her symptoms were real which was causing a great deal of stress. The patient, who was a pharmacy tech, said she was worried that she either had MS or parasites. The doctor then followed up with the question “Is there a history of abuse?” Now for those of use immersed in the world of medicine we are used to this phrase and know it is a code for drug abuse. This patient did not know that so she paused and answered: “Yes, I was raped as a child.” This answer led to Dr. Boissy learning that this patient was also a “cutter” who self-harmed to deal with all she had been through. So now I knew why the clouds in my painting had the patina of an old bruise. As the stillness that emanated from this story filled the room Veronica Combs shared that she had a miscarriage and spoke about the shock of being told that news, but quickly apologized for sharing too much information. As my eyes grew hazy from a film of tears and I looked at the faint symbol of Blue Button in the painting, it looked more like the image of an ultrasound than a healthcare symbol. I cried for Veronica who lost her baby in the messiness that is life. At the close of this event I gave this painting to Veronica, I gave my art, my creation, my baby to the woman who made true patient engagement possible this day. Thank you Veronica.